Thousands of books about soccer were written. But how to choose the best? We did research instead of you. We (at SOCCERsoda.com and our friends) read hundreds of books about sport and especially soccer. And we chose the best soccer books available. We divided them into the groups according to a genre. Just click or scroll down to the section you are looking for. Nick Hornby is now a well-known author of High Fidelity and About the Boy novels. But before he becomes a full-time writer he was (and still is) fan of Arsenal London. His novel about his years at Highbury stadium become a benchmark for any other soccer book. The Fever Pitch is a “bible” for any soccer fan. It is written with a major piece of “self-irony”. You will burst out to laugh many times. If I have to recommend one book about soccer you should read, I would choose a Fever Pitch. Another British writer, another novel about life and soccer. This time you will be taken to the world of a divorced man who is trying to keep a connection with his son. And what better way can be found than visiting the matches of their favorite club. Stoke City is that club and you will be engaged in the second league battle of an almost relegated club. It will be hard to hide sympathy for the embattled club and for a man who is trying to save his relationship. Fever Pitch is a high benchmark for any soccer novel, but She Stood There Laughing is getting dangerously close. The full review here – Check other reviews on Amazon. Alex Ferguson has a lot of time after finishing his manager job in Manchester United. There are two books with his name on the market. My Biography is the usual autobiography you would expect. His life as a player, then manager in Aberdeen and finally in Manchester United. Book Leading is about the managerial style he used. How he handled stars in United, how did he make from the cabin full of egoists one team? You will get a lot of insights into the head of Alex Ferguson. I would recommend reading “My Biography” first and then if you want more go for Leading. Check more reviews of Ferguson My Biography and Leading here. It is always strange to read a biography book from someone who is still active. That is the case of all Ronaldo and Messi “autobiography” book. However, if your kid is really into soccer and likes Ronaldo, this book will make him happy. A well-written story about Cristiano Ronaldo. From his time in Madeira to recent success in Real Madrid. It can be really inspiring for any small kid dreaming about a soccer career. I could write the same I wrote about Ronaldo book above. But Zlatan is different. He has fewer trophies than Ronaldo, but his life story is like a fairy tale. From rough streets to biggest stadiums. You can read this book like a good crime novel (but you know the happy end comes). Zlatan will give you a lot of insights into his life, practice, matches, and thinking. The story of Zlatan is probably not for the small kids as Zlatan language is sometimes inappropriate. However, Zlatan is Zlatan, not an ideal role model but still worth reading. This book is the one I like the most. One year in the life of Pep Guardiola written by Marti Perarnau. The year when he started to coach Bayern Munich after the sabbatical. Perarnau got exclusive access everywhere, into the cabin, into the management room, into the cabin of coaches. He could speak with everyone in Bayern. You will hardly find a book with so insight look into the soccer club daily operations and into the mind of one of the best coaches. And believe it is a really detailed look. This book is the best you can find on tactics, management and daily life of a big soccer club. Everybody like the US Women National Team. They are successful with four Olympic golds and three World Cup wins. But what lies behind the success? What was the development of the USA Women Soccer from the eighties till now? What leads to the success we are witnessing today? All is answered in a book by Caitlin Murray. The inside look to the women soccer in the USA. Another book about the amazing ladies playing soccer. This book is more personal with stories about the important players. The details of their careers, their fights, failures, and successes. A very inspirational book for any young girl playing soccer full of heroes and legends. Last but not least in our Women soccer section. Dan Blank wrote an exceptional book for everyone taking part in coaching, following or playing women soccer. It is written with levity but still gives you enough advice on how to coach girls in any sport, not just in soccer. This is essentially a must-read book for any female athlete or coach of females. And believe me, you will not read it just once, but you will repeatedly come back to this book for more and more advice and insights. Read more reviews of Dan Blank book here. English Premier Leagues is the richest soccer league in the world. It draws the attention of millions of fans. And this attention brings also a lot of money. From spectators at the stadiums, from tv stations, from Russian and Arabian billionaires. Premier League position among world soccer leagues is unique. It is an undisputable number one. And it will stay the same no matter where Ronaldo or Messi plays. Book The Club gives you unique insight when and where it started and how it happened. It is the best book about business in soccer I read and I doubt it will be beaten by any book in the future. Check more reviews about The Club here. This was the best book about the business of soccer before The Club was written. Socceronomics is a classic literature of soccer fans and businessmen these days. It has numerous editions as it is updated regularly with new seasons played. A book written by economists and soccer fans can be read in many ways. Either you will read it like a funny book about soccer, or you will prefer the economy side of soccer. It is your choice and you will like it both ways. More reviews of Socceronomics can be found here. It is always a hard task to find a book suitable for kids and adults too. If you want to help with coaching and improving the soccer skills of your kid you need a book which will be easy read by a kid and its coach too. Andrew Latham book is one of a kind. It is written for kids, so they will easily find out the thing they can apply immediately. And at the same time, it can be read by an adult too. They will find also a lot of interesting and useful advice about soccer. It really can be read by anyone from age 6 to 70. Dan Blank is a renowned author of books for soccer coaches and players. He can write easily with a humorous tone about any mistakes players and coaches do. Moreover, he is able to offer also solutions. What is more important, the solutions are easy to apply for anyone who would like to be a better soccer player or coach. We already mentioned Dan Blank “Everything Your Coach Never Told You Because You’re a Girl: and other truths about winning” book in Women Soccer Book section. And we need to repeat that Dan Blank is a phenomenal author of soccer books. A lot of great tips and advice for coaches and players who want to play better. Andrew Jennings is a journalist who spent a lot of time following the events at the FIFA world soccer association. And his findings are the core of the Faul! book. It is not pleasant reading and I would not recommend it to anyone who wants to keep his ideals. Soccer is like politics. Dirty and unclear with a lot of crime around. The power you gain in FIFA is so enormous, that you will try to keep it for any price. Andrew Jennings did a good job in uncovering all the dirty details. Another book about corruption in FIFA. Foul! by Andrew Jennings is broadly focused on all events in FIFA. Ken Bensinger’s Red Card is more focused on corruption related to awarding World Cup to host country. What started as IRS investigation in the USA developed in one of the biggest scandal ever in world sport. I prefer the Bensinger style of writing more than Jennings style, but both books offer a detailed insight into the top level of FIFA. After reading these two books you will lose any ideals you had about the sports managers. Interested in the lives of soccer fans in England in eighties? Violence, fights and little of soccer. The book was written by two former hooligans who recall their memories. It is not much about soccer, it is about the style of life. The young and restless factory workers who spent a lot of their time talking soccer and beating fans of other clubs or anyone who just crossed their path. This book is rough but honest. Authors are not excusing themselves, they still believe in what they did in their past, no matter how many broken noses and arms were left behind. More reviews of Hoolifan here. Not every journalist will go into the middle of a rioting mass to find out what is it to be a soccer fan. Bill Buford did it for his readers. It is about the fights and riots but also about the thinking of the crowd. How it develops into the mob. Gentler nature can be unsettled with these two books. But they give you a good insight into the society in Britain in eighties. The frustrated white men were here before we started to talk about it. In the eighties, frustrated factory worker went to the stadium on Saturday to kick out the frustration out of him. Check more reviews of Among the Thugs here. You probably know someone who watches the soccer match because he has a bet on it. It really can spice your afternoon with soccer. But what are your chances to win? 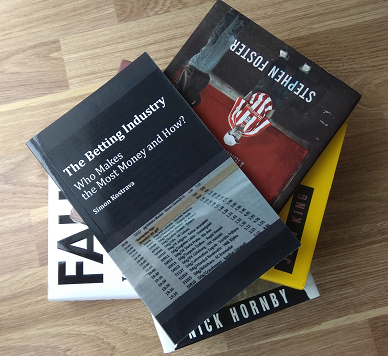 The Betting Industry book by Simon Kostrava has an answer. Kostrava is going step by step in uncovering details of the bookmaking industry. How odds are made? Who earns most and why? Reading this book will give you a lot of well-articulated reasons to stop betting on sports. Or at least will finish your hopes for easy wins.